Become a member of B!KE today! Our 450+ members play a vital role in building our community and providing financial support to our programming. 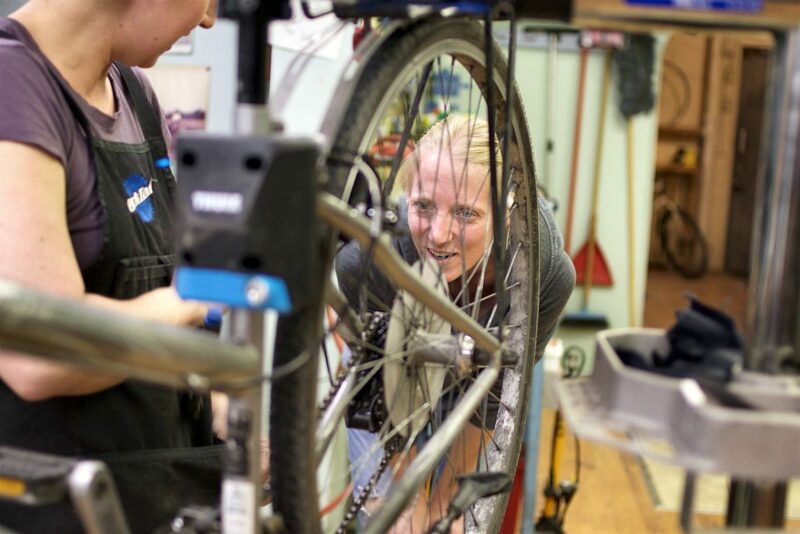 By becoming a member you gain access to our Open Shop program and the tools, knowledge, and friendly guidance to maintain and repair your bicycle. Additionally, becoming a member of B!KE is a meaningful (and affordable) step in supporting Peterborough’s bicycling community! Becoming a member online is a two-step process. 2. Send payment via PayPal by clicking the appropriate button below. Your one-year membership will be good for one year from the day that you send payment. *Youth/Student Memberships are good for youth aged 14-18 who wish to use the shop independently and current students of Trent and Fleming. **Family Memberships are good for two adults and any number of youth who will accompany either adult while using the shop. If you purchase your family membership online, please provide us with additional member names the first time you use the workshop. 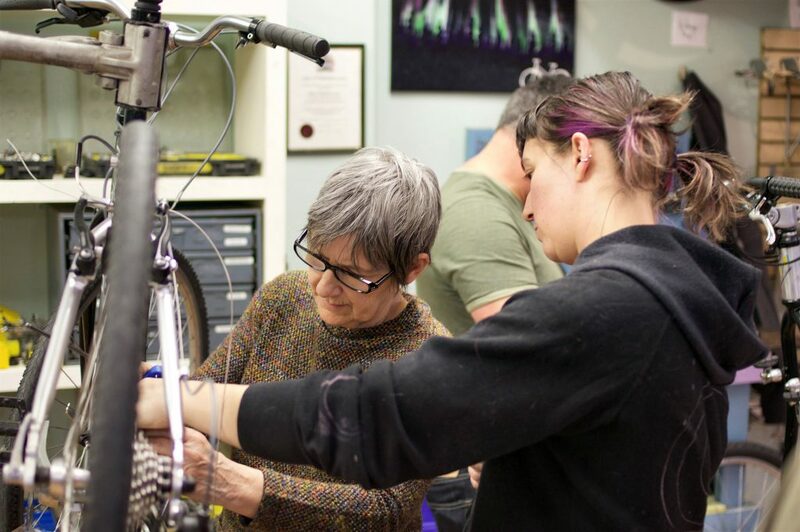 Donations of bicycles, parts, and cash, ensure that B!KE’s services remain affordable for all members of our community. Thank you for your generosity in supporting our downtown workshop space. In order to provide the best experience to our members, B!KEʼs shop space and tools are not available to the general public. Memberships must be purchased before any B!KE facilities are used. While members can work on projects for friends, they may not bring friends who are not members. This policy is important because space is limited and tools get worn and damaged. Tool damage and replacement is covered by membership fees. This means no building bikes or buying parts to sell to others, or charging others for work you’re doing while at the shop. In order to keep a useful collection of parts available for our members (that means you! ), B!KE only sell salvaged / used parts to members. B!KEʼs mechanics and volunteers are available to provide support, advice and explanatory instruction. The actual work is to be done by the member and not the mechanic. In conjunction with a mechanic, member s are responsible for assessing their ability level relative to their project, including the time required to complete it. 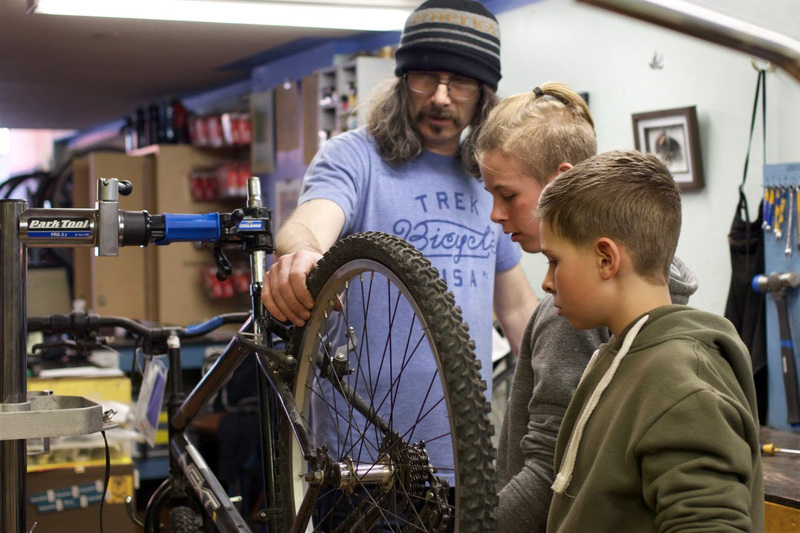 Volunteers are of varying skill levels and defer to the Head Mechanic or simply decline guidance on any area in which they are not experienced. This means that B!KE may not have the tools, parts or experience to help you with your project. There are some great for-profit bike shops in town that will definitely be able to help you if we’re all at a loss! All members and volunteers are expected to return tools to their proper locations and clean up after themselves and others, as necessary. B!KE does not run tabs. If you don’t have cash for an item, the part cannot be installed. In some cases, such as bicycle purchases, down-payments may be arranged; however, the item must remain on the premises until the full payment is made. Every subsequent week, bikes left unattended will be stored for a fee of $5 per week.All ongoing projects must be clearly labelled with a name, date and phone number. Bikes left unattended after three months will be considered property of B!KE and will probably vanish into the void. B!KE maintains an inclusive, nonthreatening environment for everyone, regardless of age, race, gender, ability, etc. Individuals behaving in rude, discriminatory or disruptive ways will be asked to leave.